If you are looking for a great slide show to help your students understand positive and negative numbers, I found a great one on Docstop. The slideshow is composed of 29 slides and is based on a number line. 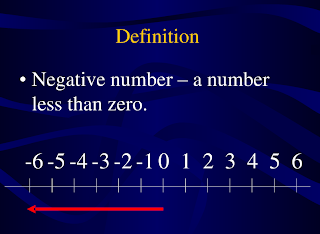 It also includes real life examples to help students better understand the difference between positive and negative numbers. The slide show also includes explanations on how to add integers. By registering with the Docstop website, you can also download the document on your computer. Nice to see some original content for once. I'll subscribe to your rss feed to get future updates. August 31, 2010 at 11:21 p.m.